Insulation Resistance: 5M ohm min. Contact Resistance 3 ohm max. Insulation Resistance 5M ohm min. 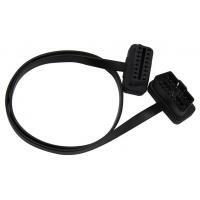 We opened plastic molds of the OBD2 OBDII OBD connectors and plugs. 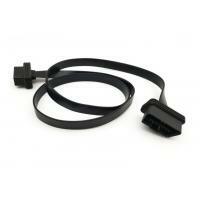 24AWG or 26AWG pure copper quality wires are employed to manufacture these cables. We can always make the cables with excellent connectivity and durability. There is a switch on the cable. Pressing the switch to switch on or off. 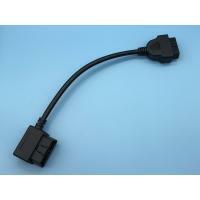 With the switch, there is no need to plug or unplug this cable frequently. 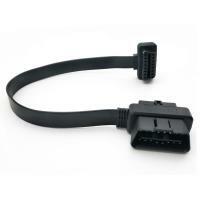 The overmolded PVC injection at the ends of 16-Pin OBD2 OBDII female and male connectors is right angle 90-degree. The overmold is with slim design. 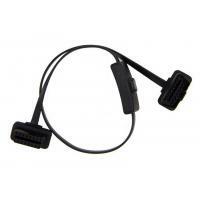 These features can help save some space when connecting and installing telematics devices. 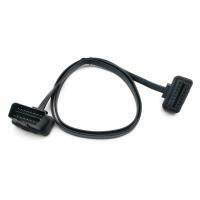 As to this pin out, Pin 4 and Pin 5 of the OBD2 OBDII male and female connectors are connected together with a short wire. The black wire in the main cable is connected to Pin 4 or Pin 5. There are 9 pins wired, but there are 8 wires of 26AWG in the main cable. As to this pin out, all 16 pins of the OBD2 OBD male and female connectors are wired, so there are 16 wires of 26AWG in the main cable. The pin assignment or pin out can also be customized according to your needs. If there is no need for more pins to be connected, we suggest we just connect the necessary pins you need and the price can be lower because the raw material and labor cost is lower. 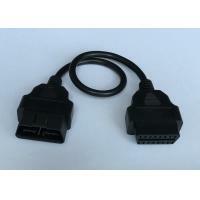 This OBD2 OBDII male to female extension cable is used to connect telematics, IoV devices, fleet management devices, OBD2 GPS trackers, OBD2 CAN programming tools, ECU tuning tools or car performance tuning tools to vehicles' 16-Pin OBD2 female ports. 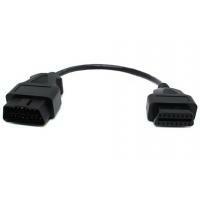 This cable can also connect OBD2 diagnostic devices or scanners or fault code readers (with the appropriate software) to OBD2 female ports in cars, mainly for dignostic purposes. 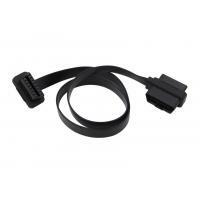 If you haven’t found or don’t have time to look for the OBD2, J1939 or J1708 cables, adapters or connectors in our website, feel free to let us know what OBD2, J1939 or J1708 cables, adapters or connectors you need by sending an inquiry (If you have a picture, please attach it in the inquiry). 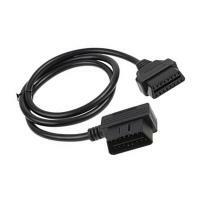 We can also customize any OBD2, J1939 or J1708 cables, adapters or connectors for you. Shenzhen Jelinn Technology Co., Ltd, founded in 2013, is dedicated to developing, manufacturing and marketing J1939 Deutsch 9 pin, OBD2 OBDII J1962 and J1708 Deutsch 6 pin cables, adapters, connectors, sockets, plugs, receptacles and enclosures for GPS trackers, ELDs, other telematics, fleet management devices, diagnostic devices, M2M devices and ECU performance tuning tools. Jelinn owns a full set of equipments for developing, manufacturing and testing such as injection molding machines, cutting-wires machines, peeling machines, terminal crimping machines, cable comprehensive testing machines, mating and unmating force testing machines, aging machines, spray machines, swing testing machines and so on. We made plastic molds of the J1939 Deutsch 9 pin, OBD2 OBDII J1962 and J1708 Deutsch 6 pin connectors, sockets, plugs, receptacles and enclosures by ourselves. Jelinn takes its aim at constant technological innovation, and manufacturing capability development. The R&D team of Jelinn is made up of sophisticated experts and engineers with years of experience in this industry. Jelinn can provide the whole connection solutions according to customers’ requirements. Uncompromising quality is Jelinn’s most fundamental asset. We were approved by ISO9001 quality management system and we implement it all the time. Its products are manufactured with the strictest standards to meet international quality and environment standards. We can always make the cables and adapters with excellent connectivity and durability. Today Jelinn has grown to be one of the most experienced and excellent manufacturers in this industry.